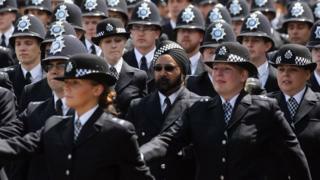 A starting salary of £18,000 for police apprentices "won't cut the mustard" for officers joining in the Thames Valley. Craig O'Leary, of Thames Valley Police federation, said the wage could "affect recruitment" in the force which was short of 98 officers in January. The chairman also questioned why apprentices, who will have the "same amount of responsibility" as other PCs, would be paid less. The force said the salary for the new scheme had "not yet been finalised". Nottingham and Derbyshire police have started to recruit apprentice officers for the first time, as part of changes introduced by the College of Policing, with Thames Valley opening positions in 2019. The Police Constable Degree Apprenticeship gives officers an option to "earn while they learn" to complete a degree in three years at a salary of £18,000. PC O'Leary said: "They're doing the same work, carrying the same workloads, learning the job, and you're going to talk about paying them less than the person that they're stood next to? "It's fundamentally wrong and certainly in terms of the pay structure that would seriously need looking at by our Chief Constable in Thames Valley because I question whether you're going to get people wanting to come in at £18,000 in Thames Valley." A spokesman for Thames Valley Police (TVP) told the BBC new apprentices would receive a "minimum of £18,000", plus a £2,000 regional allowance - but added the salary had "not yet been finalised" by Chief Constable Francis Habgood. The current starting salary for a TVP constable who started on or after 1 April 2013 is £19,971, compared to £24,447 before that date. The apprenticeship scheme is one of three potential new recruitment pathways. Mr Habgood said: "We all know that policing is becoming increasingly complex and the expectations on our staff are far higher than in the past. "Therefore the training and development of our new recruits needs to keep pace with those changes."